Remember to Bring all previous clinical documentation and a list of any medications you are taking or have taken in the past. Wearers of CONTACT LENSES MUST Take them out at least 48 hours before the visit (click here). During the eye examination the pupil is dilated by instillation of eye drops. This is essential for a complete and correct assessment of the back of the eye (retina and optic disc) and for a complete examination of refraction. This practice may cause transient burning, blurred vision, and marked photophobia (excessive sensitivity to light) lasting a few hours. In particular to driving it can be difficult and it is therefore preferable to come together. and vision are developing normally. It is also important to find any problems, such as lazy eye or cataracts, as early as possible, so it can be treated before any damage is done to the child’s vision. The ophthalmological examination of children is never a wind traumatic or painful and it is not necessary that the child is cooperative. Instead, It’s essential the help from the parent to reassure the child and make him feel at ease. The only maneuver performed during the visit that can be annoying is linked to the instillation of drops for the dilation of the pupil; this step, however, is necessary because it allows the evaluation of visual defects hidden and retina. After instillation the child will not be able to focus well, especially closely. HOW TO MEASURE THE VIEW IN A CHILD? To measure visual acuity in 3-5 years old children , we project on a screen of the “E” of various sizes and small will have to say which side are the tips of the “E”. 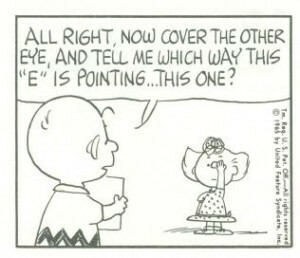 It would be appropriate before the eye examination that the parent, teach the child to describe the orientation of the points of the “E”, with the hand or with an E of cardboard. This will make this part of the visit easier to perform and more reliable. Children attended Y1-Y2 may play a matching game with the letters to practice a few days or a week before.